NASCAR sent a clear message to the Sprint Cup Series garage yesterday, handing down the harshest penalties in the history of the sport to Haas-CNC Racing. Crewchiefs Robert “Bootie” Barker and Dave Skog, and carchiefs Derick Jennings and Thomas Harris all received six-week suspensions yesterday, after illegal rear wing mounting brackets were discovered on the cars of Scott Riggs and Johnny Sauter last weekend at Lowe’s Motor Speedway. Carchiefs have never before been held accountable by NASCAR for rules violations. In addition, both teams were docked 150 owner and driver points – the most in NASCAR history – and fined $100,000. In addition, NASCAR announced yesterday that it will not return the involved cars to Haas-CNC Racing, the first time the sanctioning body has permanently confiscated an offending racecar. Last season, Dale Earnhardt, Jr.’s team received a six-week crewchief suspension and 100-point penalty for an identical violation, proving that NASCAR has not wavered in its vow to escalate penalties for Car Of Tomorrow violations, until conduct improves. As a result of the penalties, Riggs’ team drops from 26th to 34th in owner points, just five ahead of 36th-place Sam Hornish Jr. The No. 70 team plummets three positions to 43rd in points, and is now 346 points out of the all-important Top-35. Sprint Cup Series Director John Darby said late yesterday that NASCAR's message was intentionally strong, and will continue to be so in the future. Haas CNC Competition Director Matt Borland declined to comment on whether the team will appeal. Pocono Off SMI’s List, Dover Next: Pocono Raceway co-owner Dr. Joe Mattioli made it crystal clear again yesterday, telling Sirius Speedway that Pocono Raceway is not for sale, and will not be in this lifetime. Now, Bruton Smith’s attention has turned to Dover International Speedway. The Speedway Motorsports, Inc., chairman said yesterday that he has spoken with Dover officials, and that the track is "more or less for sale." Dover Motorsports, Inc., President and CEO Dennis McGlynn had little to say on the matter, citing the company's publicly held status for his inability to comment. He did say that moving one of The Monster Mile’s races to another track – as Smith would almost certainly do – makes little sense financially. "Whether we remain the way we are, or are sold, the markets don't change," said McGlynn. "We're the only track in NASCAR that serves four market; Philadelphia, Baltimore, Washington, D.C., and New York." Kerr To JTG: Former Robby Gordon Racing crewchief Frank Kerr will climb atop the pitbox for JTG Racing, serving as crewchief for driver Marcos Ambrose in four Sprint Cup races this year, and to assist with the team’s Nationwide Series operation. Ambrose is scheduled to run at Indianapolis, Kansas, Atlanta and Homestead this season, and could also make a start or two in the No. 21 Wood Brothers Racng Ford. Pocono Raceway co-owner Dr. Rose Mattioli told The Associated Press yesterday that her family has no plans to sell their Pennsylvania speedway to Bruton Smith, or anybody else. Smith recently said that his Speedway Motorsports, Inc., would be interested in purchasing the Pennsylvania tri-oval – if it were for sale – but Mattioli put that speculation to rest, saying that she and her husband, Dr. Joe Mattioli, have entrusted the track to their grandchildren, and that there will be racing there "as long as our grandkids live." She added, "It never was available; it never will be available. My husband has stated that over and over again. That's it." Dr. Joe Mattioli will join us on Sirius Speedway today (Wednesday) with more on the story. A total of 64 cars took part in the opening day of a two-day test session at Pocono yesterday, paced by David Gilliland’s Yates Racing Ford at 164.408 mph. Dale Earnhardt Jr. was second, followed by Kyle Busch, Martin Truex, Jr. and Jimmie Johnson. The test was scheduled to run until 7 p.m., but ended at 4:30 due to rain. Speeds are down about six mph from last June's pole speed of 170.062 mph, set by Ryan Newman. While France confirmed that NASCAR is considering moving some dates around next year, no new tracks are expected to be added. Sources tell Sirius Speedway that a three-way deal is in the works to move move Atlanta's fall race to Labor Day weekend, with the current Labor Day event at Auto Club Speedway in Fontana, California, moving to the early October slot now filled by Talladega Superspeedway. Talladega would inherit Atlanta’s date later that month. Riggs Ratted Out: The wing mounts on Scott Riggs' #66 Haas CNC Racing Chevrolet were confiscated Saturday by NASCAR officials, triggering a debate over whether they had been on the car all along. Crewchief Bootie Barker said the mounts have been on his racecar all season. He insisted that the mounts had passed two NASCAR inspections Thursday, but that somebody in the Cup garage dropped a dime to NASCAR Saturday, ratting out Riggs and teammate Johnny Sauter. Sprint Cup Series Director John Darby insisted that the mounts had been changed, saying, "The mounts were not in the same place as they were Thursday morning when they went through inspection." Expect penalties to be announced tomorrow or Wednesday (due to the Memorial Day holiday), similar to what Dale Earnhardt Jr's team received for a similar violation last season at Darlington; 100 points and a $100,000 fine and six-race suspension for Tony Eury Jr.
More Discord At Ganassi: Chip Ganassi said Sunday that former crewchief Jimmy Elledge’s dismissal was not due to a lack of performance, but because of a heated argument with Competition Director Steve Hmiel during the Sprint All-Star race. Ganassi said, "We had an employee step over the line. I'm sorry it happened because I like Jimmy personally, but it had to be done." Juan Pablo Montoya has expressed unhappiness with the move, and his frustration boiled over after he time-trailed 47th out of 48 cars in qualifying for the Coca-Cola 600. Ganassi said he understands that Montoya feels like he “comes out on the short end of this deal. I apologize for that, but unfortunately it was unavoidable collateral damage." Montoya finished 30th in last night’s 600. Franchitti Returns: One month after breaking his left ankle in a NASCAR Nationwide Series race at Talladega, Dario Franchitti says he hopes to climb back behiind the wheel of Ganassi’s #40 Dodge in tomorrow’s Sprint Cup test at Pocono. The team has lined up Jeremy Mayfield to drive the car next weekend at Dover, but Franchitti said he hopes a solid, pain-free performance in the two-day test tomorrow and Wednesday will prove that he is ready to return to competition. Smoke Update #712 (And Counting): J.D. Gibbs talked about the negotiations to extend Tony Stewart's contract beyond 2009 this weekend, saying, "We're still just trying to feel out exactly where he is and exactly how he feels. We want him to be here. I want him to be here for a long period of time.” Gibbs repeated his intention to hold Stewart to the final season of his contract, saying, “At the end of the day, all we can control is through next year." Coca-Cola 600 Pit Notes: Kasey Kahne snapped a 52-race winless streak in points races dating to October 2006, becoming the sixth driver -- joining Davey Allison, Dale Earnhardt, Jeff Gordon, Jimmie Johnson and Darrell Waltrip -- to win both the All-Star race and the 600 in the same year. His take for his eight-day CHarlotte run was just under $1.5 million. Speaking of winless droughts, Dale Earnhardt, Jr. is now 0-for his last 73 races, after losing a right rear tire while leading Sunday. He hit the wall, then was hit by J.J. Yeley, before hustling to pit road for repairs. NASCAR penalized him a lap for speeding past safety workers, then rescinded the penalty after further review. He eventually finished fifth, prompting this reporter to wonder how a guy can pit while pit road is closed, speed at least twice while doing so, and not be penalized in the end? Bruton's breakway series -- were it to happen -- would follow in the footsteps of such notable franchises as the XFL and USFL (remember them? ), the National Sprint Car League -- which lasted half a season after wooing most of the top talent away from the World of Outlaws -- and TRAC, the much-ballyhooed brainchild of Cale Yarborough, television executive Robert Wussler and former college football coach Danny Ford; which issued a truckload of press releases prior to its promised 2003 debut, then failed to sanction even a single lap of competition. Friends, it ain't gonna happen. Yesterday’s announcement that Speedway Motorsports, Inc., has acquired Kentucky Speedway sets the stage for some interesting wrangling over the 2009 NASCAR Sprint Cup Series schedule. 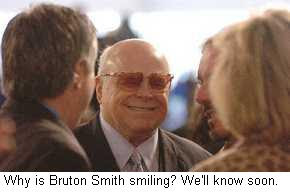 SMI Chairman and CEO Bruton Smith said yesterday that he hopes to host a Sprint Cup race at Kentucky Speedway next season, but NASCAR’s willingness to approve such a move remains in serious doubt, as does Smith’s willingness to move a race from one of his other properties. NASCAR Managing Director of Corporate Communications Ramsey Poston said today that while Smith may want a Cup race in Kentucky, he may not necessarily get one. “There are certainly some hurdles there,” said Poston, alluding to NASCAR’s longstanding contention that the Sparta, KY, oval is too close to Indianapolis, Bristol, Chicagoland and Talladega, and would further saturate an already overserved NASCAR market. Simply put, a change in the ownership of Kentucky Speedway does nothing to solve the track’s location issues. Even if Smith is able to gain NASCAR’s approval for a 2009 race at Kentucky Speedway, there is are questions about where that race will come from. NASCAR has said repeatedly that it will not add dates to the 36-week championship schedule, while stressing that SMI is free to shuffle dates between its speedways, if it chooses to do so. Most observers believe that Kentucky Speedway’s race date will come from either New Hampshire or Atlanta Motor Speedway, but the presidents of those two tracks say they are confident that they will continue to host two races in 2009, and beyond. NHMS President Jerry Gappens and Atlanta Motor Speedway’s Ed Clark say they plan to finalize their 2009 sanction agreements with NASCAR today, and that both tracks will host the Sprint Cup Series twice next season. “Bruton has not given me any indication at all that he's looking to change anything," said Gappens, while Clark said, "I'm tired of people bringing that up. You can go ask Bruton, you can ask me. There is no chance (of losing a race). It is not going to happen." 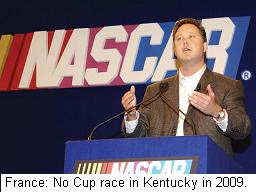 Gappens hinted that there could be a more complicated deal in the works to bring NASCAR’s top series to Kentucky, without taking a race from New Hampshire or Atlanta. In his words, “I think there's more to the puzzle that (Bruton) has got to finish, to do some of the things he's thinking." Sources say that plan could involve the purchase of yet another track; either Dover International Speedway – owned by Dover Motorsports, Inc. – or the Mattioli family’s Pocono Raceway. However, time is short for Smith to forge such a deal. NASCAR is in the process of finalizing its 2009 sanctioning agreements right now, making the timeline for moving a race extremely tight. Sources say SMI will have to submit a plan to NASCAR in the next two weeks, outlining which of its tracks will give up a race to put Kentucky on the 2009 schedule. Even then, NASCAR has the final say on whether the change will take place. Clearly, Smith would not have purchased Kentucky Speedway without a concrete plan to bring Sprint Cup Series racing to the track in the near future. Equally clear, however, is the fact that Kentucky Speedway’s fate does not lie solely in Smith’s hands. Will NASCAR allow SMI to transfer a race to Kentucky, ignoring its longstanding concern with market saturation? Or will the sanctioning body stand on principle, denying Kentucky a spot on the Sprint Cup calendar and leaving Smith holding the bag on a multi-million dollar gamble gone wrong? SMI To Announce Kentucky Acquisition? A press conference is scheduled for 3 p.m. ET today in Concord, NC, where Speedway Motorsports, Inc. is expected to announce the full or partial purchase of Kentucky Speedway. The track is currently owned by a group headed by Jerry Carroll, and while the details of this afternoon’s announcement are still unclear, it appears to involve a sale of the speedway – in full or in part – to SMI. SMI Chairman and Chief Executive Officer O. Bruton Smith is scheduled to address the media at this hour in the Media Center at Lowe’s Motor Speedway, and Sirius Speedway will take you there live as soon as the press conference begins. In addition to adding an eighth NASCAR track to SMI’s portfolio, the sale of Kentucky Speedway to SMI would also impact the antitrust lawsuit filed against International Speedway Corporation and NASCAR for allegedly conspiring to prevent the speedway from getting a spot on the NASCAR Sprint Cup Series schedule. Lawyers for the track are appealing a decision handed down in early January by a United States District Court judge to dismiss that lawsuit for lack of evidence. In order to host a Sprint Cup Series race at Kentucky Speedway, SMI would presumably have to move one of their existing events from another track. SMI also owns Lowe’s, Texas, Atlanta, Bristol, Las Vegas and New Hampshire Motor Speedways, as well as Infineon Raceway in California. JPM "Frustrated" With Changes: Juan Pablo Montoya is pulling no punches in expressing his unhappiness with a pair of crewchief changes for his team in the last few weeks. In late April, Ganassi swapped crewchiefs between two of his teams, sending Jimmy Elledge to the Montoya team, and Donnie Wingo to the Reed Sorenson camp. Elledge was released by the team Tuesday after less than a month on the job, replaced by Brian Pattie. Montoya said of the move, “I am pretty frustrated. They told me 'We are thinking of getting rid of Jimmy' and I said 'Don't do it.' Next thing I knew, they did.” He said he was satisfied with the direction Elledge was taking the team, and has expressed his frustration to team owner Chip Ganassi several times in the last 24 hours. Crab Eradication: NASCAR has issued a memo limiting adjustment of the rear axles on the new Sprint Cup Series racecar. The rule takes effect next weekend Dover International Speedway, and pieces like the one used last week by Sam Hornish Jr. in the Sprint All-Star Race will be outlawed, effective immediately. The new rule allows a maximum of one degree of rear toe, and Sprint Cup Series Director John Darby said 98-percent of teams are already running within the limits of the new rule. The rest are at 2 degrees. Big Buck Duck: Roush Fenway Racing announced yesterday that Aflac Insurance will serve as primary sponsor on Carl Edwards' No. 99 Ford beginning next year. Today’s edition of Sports Business Daily reports that the deal is a three-year pact worth $26 million a year; second only to the $30-million per year Dale Earnhardt Jr.’s team receives from Amp Energy Drink and the National Guard. Helio Says No: Helio Castroneves is denying published reports that he plans to leave the IRL IndyCar Series for a career n NASCAR. said Wednesday he doesn't plan to leave the IRL's IndyCar Series for NASCAR any time soon. A story in Wednesday's Los Angeles Times said Castroneves was interested in following former IRL stars Sam Hornish Jr. and Dario Franchitti to NASCAR, as soon as next season, but the former Indianapolis 500 champion said today that his comments were taken out of context. In his words, "My English is apparently getting worst. I did not understand much of what they wrote. They definitely took it out of context." Castroneves will start fourth in Sunday's 92nd running of the Indianapolis 500. Former Sirius Speedway producer Ryan "El Ryno Grande" Horn mugs for the camera during the recent NASCAR Nationwide Series excursion to Mexico City. Clearly, the locals were extremely impressed! Kyle Busch has taken a lot of heat lately. 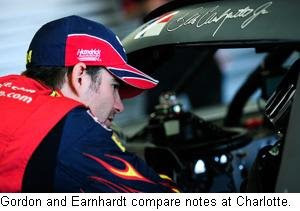 Since crashing Dale Earnhardt, Jr., out of the lead with just over a lap to go at Richmond International Raceway last Saturday night, NASCAR's most controversial driver has baked in a crucible of public scorn. That kind of heat does one of two things to a person. Either they melt, or they become tempered to a strength they could never have imagined. The Joe Gibbs Racing driver overcame loose lug nuts, numerous bouts with the wall, and challeges froma handful of determined competitors to conquer the legendary Darlington Raceway Saturday night; his third Sprint Cup win of the season and his eighth of the year in NASCAR's top three series'. The fans boooed lustily as he cut his requisite victory donuts, then amped it up another notch as he emerged from his battered Toyota in Victory Lane. It got seriously loud when he delivered a flourishing, exaggerated bow to the packed Darlington grandstands, saying that the louder they hooted, the faster he would drive. "I don't care (about the booing)," he said. "I'm here to win. If I win, it just makes them more upset and crying on their way home. Somebody threw a beer can at me. Next time, just make sure it's full so I can enjoy it out there." Busch is equal parts Cassius Clay, John Rocker and a young Darrell Waltrip; dominating the competition the way very few ever have, then spouting off with a reckless abandon seldom (ever) seen in today's squeaky clean, sponsor-friendly NASCAR. Love him or hate him -- and there are plenty of folks on both sdes of that particular fence -- it's difficult to deny his talent, or ignore the impact he has made on the sport. His eight victories are far and away best of any NASCAR driver this season. He has won in something -– from Late Models to Trucks to Nationwide to Sprint Cup -– in each of the last six weekends, and that streak does not appear ready to end anytime soon. 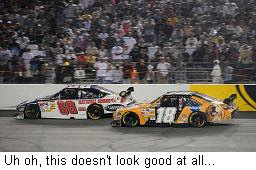 Kyle Busch is hot, like it or not. All Labonte, All The Time: If the sponsors approve, it looks like Petty Enterprises could field an all-Labonte team next month, with Terry Labonte joining brother Bobby in a Petty Dodge when Kyle Petty heads to the TNT television booth for the midsummer stretch. Petty will drive in next weekend’s Coca-Cola 600 at Lowe’s Motor Speedway, with Terry Labonte and Chad McCumbee then splitting time in the car over the next seven races. McCumbee is tentatively scheduled to drive the car at Dover and Chicago, with Labonte handling the other five races. Labonte would be the most recent former champion not in the Top 35 in owner points, guaranteeing him a starting spot in all five events. 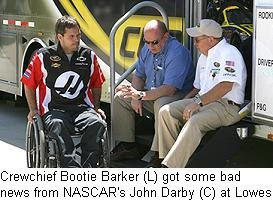 The Labonte Brothers have run as teammates once before, when Terry ran five races for Joe Gibbs Racing in 2005. No Rest For The Weary: The NASCAR Nationwide Series is off this weekend for only the second time since Daytona, but a majority of the teams will spend the week testing at Lowe's Motor Speedway. More than 40 drivers from 20-odd different teams are expected to participate in the fourth scheduled Nationwide Series test of the year. In other testing news, Goodyear has scheduled a tire test at Daytona International Speedway tomorrow and Wednesday, in preparation for the 50th Annual Coke Zero 400 on Saturday night, July 5th. Defending race winner Jamie McMurray will join Mike Skinner and Elliott Sadler as test drivers. No Chevrolet team will take part in this test, as part of Goodyear’s regular manufacturer rotation. And Finally... 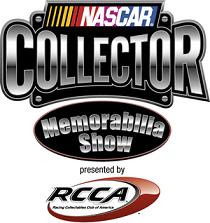 If you’re in town for All-Star week at Lowe’s Motor Speedway, you might want to check out the NASCAR Collector Memorabilia Show presented by the Racing Collectables Club of America, Saturday at the Embassy Suites, just down the street from Lowe’s Motor Speedway. The show features collectors from all over the country; buying, selling, trading and display everything from die-cast cars and trading cards to racecar sheet metal and more. The show runs from 7 a.m. to 4 p.m., and is open to the public. Tickets at the event are $10, but free tickets can be printed at goracing.com. A number of NASCAR stars are scheduled to appear, includng Kasey Kahne, Rusty Wallace, “Humpy” Wheeler, Junior Johnson and Terry Labonte. Sirius NASCAR Radio’s NASCAR Collector will originate live from the show from 7-9 a.m., with hosts Mike Storms, Buzz McKim, Tim Trout and Howard Hitchcock. Yours truly and The Morning Drive’s Mike Bagley will emcee the live events throughout the day, so come on out and say hello. Tony Stewart commented yesterday on the rumors surrounding his possible departure from Joe Gibbs Racing, and his alleged dissatisfaction with JGR’s offseason move from Chevrolet to Toyota. The two-time NASCAR Sprint Cup Series champion appeared at Indianapolis Motor Speedway Wednesday to help Chevrolet introduce its new midget engine, and while admitting that Chevrolet’s support of his various short-track teams constitutes a personal endorsement of sorts, he scoffed at the suggestion that he is unhappy driving a Toyota for JGR. "It wasn't weird when we started the (short track) program…and it's not weird now,” he said. “When we started our program, Mopar provided us with engines, and both sides understood." Stewart once again confirmed that he is talking with other teams about leaving JGR when his contract expires at the end of the 2009 season, and that he has broached the topic of terminating his deal with Gibbs a year early, if the right offer comes along. He also discussed his longtime dream of winning the Indianapolis 500, saying that he doesn’t see a return to Indy happening in the near future. Stewart said he is not interested in a one-off Indy 500 bid, adding, “I don't want to…show up for the month of May. If I am going to do it, I need to start (in the season opener) at Homestead. I need to run all of the races leading up to the month of May, to really feel like I am being fair to the team and being fair to myself. As long as I'm driving a stock car, that basically takes that part of it out of the equation." Jamie McMurray topped the speed chart in last night’s final Sprint Cup Series test session at Lowe’s Motor Speedway. 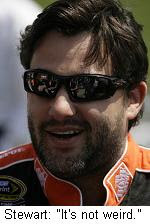 His fast lap of 185.720 mph was slower than the 186.245 recorded by Elliott Sadler on Monday night. Ryan Newman was second fastest last night, followed by A.J. Allmendinger, Scott Riggs and rookie Patrick Carpentier. Nearly 50 teams took part in the two-day test. Dale Earnhardt Jr. crashed his Chevrolet during the session, dong enough damage to force his retirement for the night. 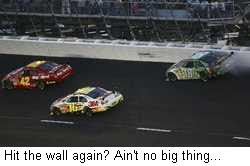 Regan Smith and Kurt Busch also scraped the wall in separate incidents, doing only minor damage. Park The Black Copter: Denny Hamlin said yesterday that the conspiracy theorists are wrong. Hamlin said his decision to stop on the racetrack after cutting a tire while leading Saturday night at Richmond was made to save his racecar, not to help teammate Kyle Busch. Hamlin said, “I didn't want to risk tearing up the car where we couldn't finish the race. I knew I had to stop, or else we were going to get a DNF. I didn't even know where Kyle was out on the racetrack. For all I know, he was leading the race." Woods Go Retro: Wood Brothers Racing will field a special 1971 Mercury paint scheme on its #21 Motorcraft Ford Fusion in Saturday night’s Dodge Challenger 500 at Darlington. Bill Elliott will drive the car, outfitted with the same candy apple red and white paint and gold numbers that David Pearson drove to five wins and eight poles at Darlington. Pearson recently turned a few laps in the original car, restored to race-ready condition by Leonard Wood after it sat for more than 30 years on display at the Darlington Raceway Museum. Marlin Back With Ganassi: Sterling Marlin will drive Chip Ganassi Racing’s #40 Dodge Saturday night, while Dario Franchitti continues to recover from the broken left ankle he suffered at Talladega Superspeedway last month. Marlin tested the car Monday and Tuesday at Lowe's Motor Speedway. Franchitti was fitted for a carbon fiber brace last week, but will sit-out for at least one more week to give the ankle more time to heal. His status will be evaluated on a week-to-week basis. Sorry Kenny: A late change has Johnny Sauter behind the wheel of the #70 Haas CNC Racing Chevrolet this weekend at Darlington. The original entry list had Ken Schrader driving, and that was confirmed by last weekend by Competition Director Matt Borland. But an updated Sprint Cup Series entry list for Saturday night’s race now lists Sauter as the driver. He drove for the team at Phoenix and Richmond, qualifying for both races before finishing 37th and 33rd after being swept up in a pair of accidents. There was a whole lot of pot running around the garage Saturday night at Richmond International Raceway, and it had nothing to do with NASCAR's embattled substance abuse policy. Rather, it was a case of two "pots" calling the kettle black, in their rush to condemn the late-race actions of Kyle Busch. "Pot #1" was old friend Jimmy Spencer, who blasted Busch on SPEED's weekly post-race program. As winner Clint Bowyer sprayed champagne in the background, the analyst formerly known as "Mr. 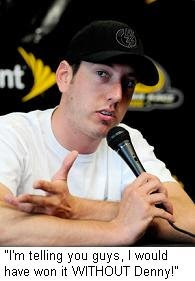 Excitement" laid Busch out in lavender, saying the Joe Gibbs Racing driver "made a major, major mistake. He drove in the corner too hard, and he took out Dale Junior. That is...disrespect for your fellow competitor. He did not respect Junior enough to back down a little bit." Spencer also took the NASCAR On FOX broadcast team of Mike Joy, Darrell Waltrip and Larry McReynolds to task, accusing them of "political correctness" for categorizing the Busch/Earnhardt incident as a simple racing accident. With all due respect to Spencer, I'm old enough to remember just about all of his racing career. I watched Jimmy race modifieds around the northeast, before he got the call to the upper echelons of NASCAR. I also saw virtually every race of his Nationwide and Cup Series careers. Nowhere in that 25-year span do I recall Jimmy Spencer ever "backing down" from a battle for the lead, especially with less than two laps to go. The Jimmy Spencer I remember would rough you up, push you aside, even spin you out if that was what it took to win. He'd also blacken your eye in Victory Lane if you cared to discuss it further. 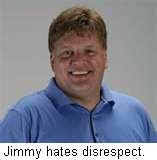 It wasn't "disrespect" with Jimmy. It was good, hard, testosterone-rich racing; something Spencer did as well as anybody out there in his day, and something Kyle Busch is pretty good at today. 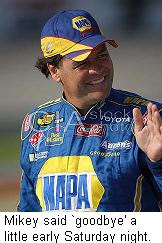 "Pot #2" was Michael Waltrip, who blasted Busch with both barrels on Monday night's This Week In NASCAR. "You can't just be that irresponsible," said Waltrip, as footage of the Busch/Earnhardt crash rolled. He called Busch's actions "unacceptable behavior," adding, "You can't just run over the leader and wreck (him)." Amazingly, this is the same Michael Waltrip who had been thrown out of the race by NASCAR just hours before, for intentionally crashing Casey Mears. Thankfully, Hendrick Motorsports crewchief Chad Knaus was on Monday night's panel as well, and provided a much-needed dose of balance. "Just because (Kyle) has a bit of a cloud around him right now, I don't think you can throw the whole Junior Nation at him," Knaus said. When the topic eventually turned to Waltrip's own Saturday night transgressions, he attempted to lay the blame on Mears, who triggered Mikey's high-horsepower tantrum by squeezing him into the wall moments before. "What you expect at that level is someone to not make that mistake," sniffed Waltrip, conveniently overlooking the smoke billowing off his rear tires as he pushed a helpless Mears the length of the straightaway. It wasn't pot smoke, in the literal sense of the word. But it was ironic, in the extreme. UPS Laying Low For Now: After being linked with a number of different drivers and teams in recent weeks, officials of United Parcel Service released a statement yesterday, saying that they are not currently negotiating with any Sprint Cup team or driver. Michael Waltrip Racing Vice President Cal Wells said recently that UPS has had preliminary discussions with a half-dozen teams about the 2009 season, and beyond. Roush-Fenway Racing President Geoff Smith confirmed that Saturday, saying that UPS has spoken to a total of six or eight race teams, including Roush-Fenway. For those of you who don't speak corporat-ese, Rogowski's comments loosely translate to, "Listen guys, we don't want to have to answer questions every two days for the next six months. We're out there, we're looking, and we have talked to a bunch of teams, but we haven't decided what we're going to do yet. "So please, leave us alone." I spent Sunday afternoon at my favorite local short track; Thunder Road International Speedbowl in Barre, VT. Before I had made it to the pit gate at 9 AM, a fan asked, "Who do you think was at fault in the Kyle Busch/Dale Jr. crash last night?" "I don't think it was anyone's fault," I replied. "But I know who's going to get blamed!" Junior and Kyle said essentially the same thing in their respective post-race interviews. Saturday night's late-race tangle was unfortunate, it was regrettable, and it was a racing accident. That view was echoed by eventual winner Clint Bowyer, who had the best view of anyone in the house, and by every TV and radio commentator on site. The fan reaction, of course, was completely different. By the time Sirius NASCAR Radio hit the air with it's Post-Race Show mere minutes after the checkered flag, the indignant inhabitants of Earnhardt Nation were lined up 10-deep to vent their collective spleen. Kyle Busch, they said, was Charles Manson, Adolph Hitler and the Unibomber; all rolled into one skinny, detestable little package. They called on NASCAR to throw him out of Saturday night's race, suspend him for his transgressions, or better yet, take him out behind the trailer and have him shot. It continued for the remainder of the evening, and ramped up again the moment the phone lines reopened on Sunday morning. I'll bet the mortgage that Mike Bagley and David Poole will fill the Monday morning hours with it on "The Morning Drive," followed by four more hours of venom on "Tradin' Paint" with Steve Post and Chocolate Myers. Then it'll be my turn on "Sirius Speedway." Caller #1 will ask (with great indignance) when NASCAR is going to "do something about Kyle Busch." Caller #2 will announce that he Tivo'ed Saturday night's race, and that after 167 viewings of his personal, super-slow-motion replay, he has determined that Busch intentionally turned right to wreck Earnhardt. Caller #3 will say he wishes Steven Wallace had decked Busch when Shrubby stuck his head in Wallace's car following Friday night's Nationwide Series race. Caller #4 will opine that Mr. and Mrs. Busch are horrible parents, since both Kurt and Kyle are immature, egotistical, and the greatest threat to our American way of life since the atomic bomb. Caller #5 will accuse me of being a Kyle apologist; adding that everyone he knows agrees that Busch intentionally took Earnhardt out, and that I am nothing more than a NASCAR mouthpiece. I will remain calm, composed and tolerant throughout my four-hour ordeal, understanding that at the very least, this most recent controversy will sell a crapperload of tickets for next Saturday night's race at Darlington Raceway.